Computerworld Honors Laureate in the education and academia category. The award will be presented April 7 in San Franciscos City Hall. Research assistant Praveen Thiagarajan (seated), a graduate student in electrical and computer engineering, and Karl V. Steiner, associate director of DBI, view a six foot, 3-D biomedical image that can be interactively manipulated and explored in DBIs visualization studio. Each organization or individual to be considered for the award must be nominated by the chairmens committee, consisting of 100 chairpersons, presidents and CEOs of leading information technology programs. DBI was nominated by Robert Bishop, CEO of Silicon Graphics Inc.
For the award, DBI was invited to submit a case study of the program, which becomes part of the Computerworld Honors Programs permanent research collection on the history of information technology at 150 libraries, museums and universities worldwide. It also becomes part of the Computerworld Honors Archives Online at [www.cwheroes.org]. Visualization becomes an important factor to facilitate interdisciplinary collaboration, Steiner said, and the studio provides a unique environment to bridge the language gap between researchers from different scientific disciplines through the use of computer models, simulations and interactive visualization tools. By taking highly complex and data-intensive events in the life sciences and transforming them into a visual language that can be interpreted in a collaborative way, we believe that we have laid the foundation to rapidly explore new ideas that may lead to new knowledge, Steiner said. The visualization studio also provides a collaborative educational setting where students learn more in minutes than they could achieve in many hours of independent work at their individual workstations, according to the case study. DBI focuses on the interface between biology, biochemistry, biosystems engineering and computer and information science in such areas as plant and cell biology, genetics, proteins, human health, marine ecosystems, poultry genetics and biomaterials, and serves 12 academic departments at UD and other colleges and universities throughout the state. In addition, Christiana Care Health System has established a research program with UD and DBI for biomedical imaging analysis, and plans are under way to explore DBIs technology for interactive surgery planning. Founded in 1999 and directed by David Weir, DBI is a statewide initiative. It houses 23 laboratories and six state-of-the-art core instrumentation centers for mass spectroscopy, DNA and protein sequencing, DNA and protein structuring, custom microarrays, structural biology and bioimaging. All of the labs are linked to a bioinformatics center to simulate, store and analyze large amounts of biotechnology data and life sciences images. 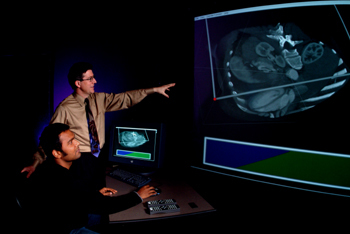 The visualization studio enables researchers to study these in an immersive, interactive, 3-D environment. For example, Praveen Thiagarajan, a graduate student working under the direction of Guang Gao, UD professor of electrical and computer engineering, has devised a tool for scientists to display stereo models of microscopic cross-sections. Kirk Czymmek, director of the DBI Bioimaging Center, used this technology to study a quarter-inch cross-section of a rat kidney, which in the visualization studio is displayed as a six foot, 3-D image that can be interactively manipulated and explored. The studio is an extremely powerful tool for understanding cellular processes, Czymmek said. The visualization studio gives other researchers, such as Yong Duan, assistant professor chemistry and biochemistry at UD, a computation and visualization framework for discovering and comparing amino acid sequence patterns. These processes occur in nature in a few nanoseconds. Duan uses modeling and simulation to study this process and applies visualization to show the peptide fold from its initial straight-chain formation to gradually assume a helix formation. The visualization studio was funded primarily by the National Center for Research Resources of the National Institutes of Health under the Delaware Biomedical Research Infrastructure Network program, with matching funds provided by the state.